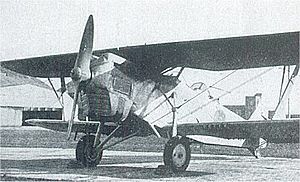 The Kawasaki Ki-3 (九三式単軽爆撃機, Kyūsan-shiki tankei bakugekiki) was a light bomber built by Kawasaki Kōkūki Kōgyō KK for the Imperial Japanese Army in the 1930s. It was the last biplane bomber design to be produced for the Imperial Japanese Army Air Force, and saw combat service in Manchukuo and in north China during the early stages of the Second Sino-Japanese War. The Ki-3 was a biplane design of all-metal construction with light alloy and fabric covering, with staggered wings and a fixed, divided landing gear. It was powered by one supercharged 592 kW (790 hp) BMW IX V12 inline engine, driving a wooden two-bladed propeller.. Maximum speed was 259 km/h (161 mph) and maximum take-off weight 3,097 kg (6,830 lb). One 7.7 mm (.303 in) machine gun was mounted to fire forward, synchronized with the propeller, and anther was mounted dorsally on a flexible mount. The maximum bomb load was 500 kg (1,100 lb). The two man crew sat in open cockpits. The Ki-3 originated as a private venture, launched by Kawasaki to develop a dedicated reconnaissance aircraft. The prototype, designated KDA-6, was designed by the German engineer Dr. Richard Vogt, who was working in Japan at the time. Takeo Doi the future chief designer for Kawasaki, worked as Vogt's assistant on the project; Vogt later went on to become chief designer for Blohm & Voss. The Kawasaki Ki-3 was designated "Army Type 93-1 Single-engine Light Bomber" under the other Japanese military aircraft nomenclature system. It flew in April 1933 and entered operational service initially with the 6th Composite Air Regiment in Chosen (Korea). It subsequently was used in combat in Manchukuo (Manchuria) and in north China during the initial stages of the Second Sino-Japanese War, where it could make use of its with good maneuverability to support ground troops. It was considered a rugged ground-attack aircraft, but the supercharger of its liquid-cooled engine was a constant source of problems. Ki-3 (Army Type 93-1 Single-engine Light Bomber). 243 built (3 prototypes, 200 by Kawasaki and 40 by Tachikawa Aircraft Company Ltd) from January 1934 till March 1935. Lake, Jon (2002). Great Book of Bombers. pp86: Zenith Press. ISBN 0760313474. Mikesh, Robert; Shorzoe Abe (1990). Japanese Aircraft, 1910-1941. Annapolis, MD: Naval Institute Press. ISBN 1557505632.